El Paso’s largest electronic dance music festival is one of the most anticipated events in the region for dance music lovers! Based out of Ascarte Park this festival, in its 5th year, brought a strong, diverse lineup this time around. 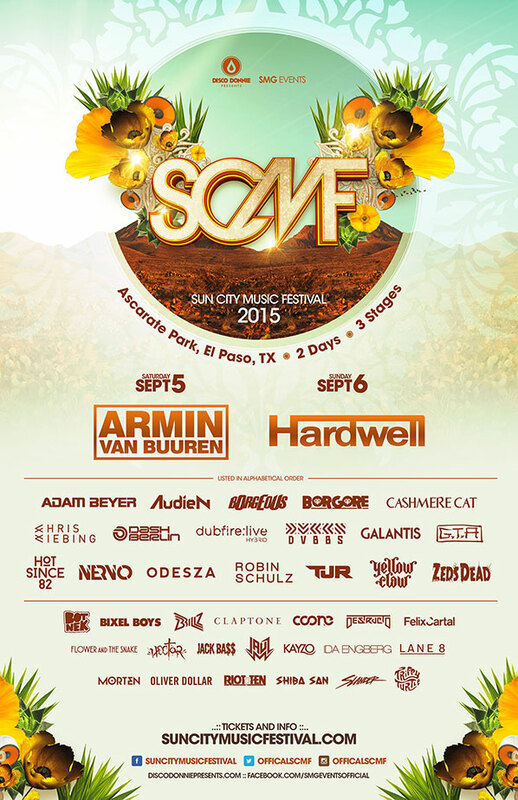 The first day of the Sun City Music Festival was so good! We walked around all the stages but the acts I wanted to see we’re all in the main stage. Slander really threw down one heck of a set! And Audien was one of my favorite acts that day as well. Robin Schulz was great! The stages were all different in their own way but they were all pretty unique with their own personalized visuals and lights. The staff and security we’re pretty good. I had absolutely no problems with anybody. The food was great! They had these delicious pulled pork fries with cheese. The beer was cold so I couldn’t complain about that. The crowd was not bad at all minus a few that like to shove their way through the mass of people. The crowd was pretty high energy day one. You can see the excitement everywhere, people dancing, people talking. There was a bunch of El Paso county sheriffs deputies walking around. When the Dash & Armin came out the production was at its best fireworks and pyros. The second day of the Sun City Music Festival was just as great as the first. I caught Morten at the main stage and he was pretty amazing. The production was on point. The staff were good to me. Again I did not have any problems there with anyone. Now I’m sure the sheriffs probably did arrest a few people or confront some but not me nor did I witness anything of that sort. Jauz absolutely destroyed his set! That was another act that I really wanted to see since I had never seen him. Borgeous and TJR had a really good sets both in their own different styles. Now when NERVO & Hardwell came out the production was at it’s best. Pyros and confetti being blasted constantly. Fireworks were amazing. Overall I think the vibes were great! People wanted to party and rage and have fun. I had a great time. Everything was pretty easy to find there were big signs everywhere telling where everything was. The staff were friendly to me. The restrooms, water stations, food stations, and bars were all at the center in the middle of the three stages. The restrooms too. The few times I had to use the restroom it was decent and there was lines to that but there was plenty of restrooms too. Both of the days we showed up at 5:00-5:30 pm so we didn’t really have to wait in line at all to get the fest both days. Now if we had waited until 8:00 pm I’m sure the lines were probably long but by that time we were inside raging to good music. If I had to pick which stage was best I’d go with the main stage. It was just massive, the pyros, fireworks, LED screens, sound system were greater then the other two. Both days were incredible. I had no problems with neither staff or deputies. If I could go back in time I would. Would I go again? Of course. #ElPasoKnowsHowToParty! • No panel flooring was placed around the stages so it became dusty at times and when water was spilled a few muddy areas appeared.